The FHA Mortgage has a ton of benefits including lower interest rates, more flexible debt-to-income ratios and affordable mortgage insurance. However, the FHA program does have some downsides. Read more below as we highlight what it means to buy FHA-approved homes and FHA approved townhomes. 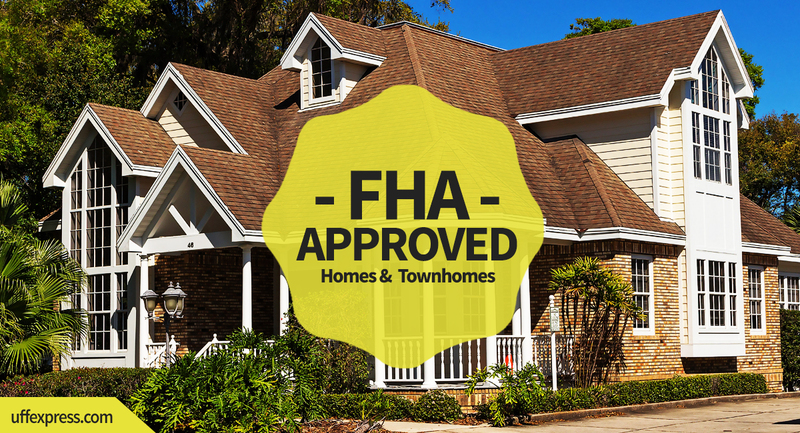 What is An FHA Approved Home or Townhome? FHA, along with the other government loan program such as the USDA Loan and the VA Loan, have minimum property requirements. What this essentially means is that the FHA has requirements that the home itself must meet in order to be considered an FHA approved home or an FHA approved townhome. Without the home being FHA approved, the lender is not allowed to close on the mortgage to allow a borrower to buy or refinance the property. The Federal Housing Administration (FHA) – which is backed by the U.S. Housing and Urban Development – wants to ensure borrowers are buying homes that ultimately won’t cost you a lot of money in repairs as well as homes that are safe to live in. If homes are found not to be FHA approved, repairs can be made in order to meet the minimum property requirements and thereby allowing the lender to close on the mortgage. Who Determines if the Home is FHA Approved? Lenders are required to order an appraisal to confirm the value of a home, and it is the appraiser’s responsibility to determine if homes and townhomes meet the FHA approval requirements. The appraisers must be certified to become an FHA approved appraiser, thereby allowing them to appraise homes for FHA loans. While the appraiser is out looking at the home to do their appraisal report, they are also keeping eye out for issues that the FHA requires for the home to be deemed FHA-approved. Most top real estate agents will have a good idea of what it takes for a home to be FHA approved, however, it’s good to have a general concept yourself. If you need assistance finding top real estate agents in your area, and you’re located in one of the states we’re licensed to lend in, then chances are we have a few connections to help you. What Happens if a Home is Not FHA Approved? If you’re buying a house or refinancing your existing one, and the appraiser flags items on the appraisal that require repair, then there is still a chance to fix the problems. In-fact, most issues are correctable. It is relatively common for homes to not be FHA approved initially. In approximately 15-20% of scenarios, the appraisal will come back “subject to” repairs being completed on the home. The lender needs an “as is” designation from the home to be considered FHA approved. So if the home comes back “subject to” that means something has to be fixed. If you’re buying a home or townhome, then your realtor will work with the seller’s agent and determine if the seller is willing to fix the required repairs. Generally, both parties (buyers and sellers) come to an agreement for somebody to fix the repairs (typically the sellers). There can sometimes be deal-breakers such as serious issues with roofs or foundations. If you’re refinancing a home, then your lender will make you aware of the issues and it’ll be up to you to fix the items before the loan can be approved. Assuming all items get repaired, the lender is required to order a ‘final inspection’ (or final appraisal) in which the appraiser goes back out to the property to ensure all items have been fixed according to the FHA requirements. If the appraiser agrees all items now meet FHA requirements, they’ll sign off and make it an FHA-approved home. United Fidelity Funding is a multi-state, direct mortgage lender that offers low mortgage rates and fees. With no regional or national marketing budgets, United Fidelity Funding Mortgage keeps costs low and passes the savings on to our customers. Our team of highly-experienced loan officers average 7 years in the business, making us some of the most trusted experts and knowledgeable experts you’ll find.